Designer(s) MAKHROV, V. P. & SMIRNOV, A. & PUGACHEV, Yu & PETUKHOV, A. 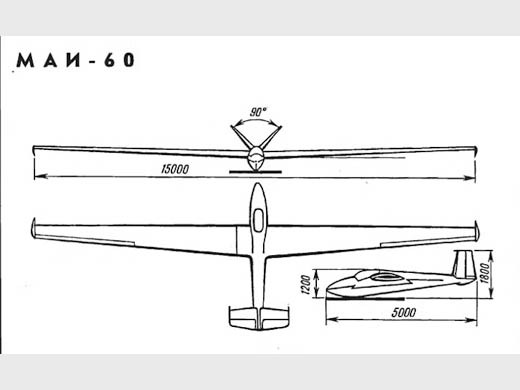 & SMIRNOV, V. & SAVIN, V. & RHINE, Järv & MAKIEVSKAYA, E. & MIKHAILYUK, A.
Infos techniques Cantilever mid-wing monolplane glider with a V-tail empannage. A NASA laminar airfoil was adopted. It had a all wooden structure with the extensive use of PKhV plastic foam. The wing had a box construction which extended from 25% to 65% of the chord. The leading and trailing edges were filled with plastic foam enchancing the rigidity of the 1 mm thick plywood skin. The fuselage monocoque structure was made of bulkheads and stringers with plywood skin. The wing was attached to the fuselage by multi-teeth pin joints. The landing gear consisted of a fixed skid, a central mainwheel and a tail skid. The cabin with a jettisonable perspex canopy was fitted with a semi-reclined seat for backpack parashute. The tail control surfaces, ailerons and airbrakes were connected to the controls by cables. 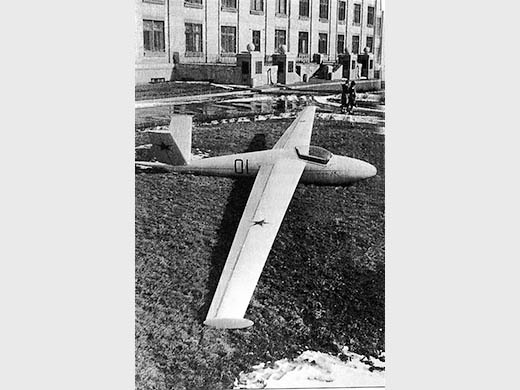 Histoire résumée The MAI-60 was the prototype of a standard class sailplane. It was designed under the guidence of N. N. Fadeyev by a student design team led by V. P. Makharov (Ю.В. Макаров), and was built by MAI workshop in 1961. MAI-60 was flight tested in 1961-1962 by test pilots V. I. Kirsanov and V. I. Perov (et Sergei Anohkin ?). The poor directional stability, excessive need for pitch control and unusual spin characteristics, as well as the quality - poor adhesivity - of the VIAM-B-3 glue prevented this sailplane to be approved for normal use. par KRASILSHCHIKOV, A. P. (2005) [p. 237, 245, 246, 247, 333. Note + 2 photos + plan 3 vues + specs].